NORTH ADAMS, MA – PRESS: Letterpress as a Public Art Project, will open its fourth exhibition, “This One Goes to ELEVEN, Part 2” with an opening reception on Thursday, Sept. 29, from 6 to 9 p.m., which is free and open to the public. The exhibit runs through Oct. 26. Melanie Mowinski, assistant professor of visual art at MCLA and proprietress of PRESS, will operate the Vandercook Universal III, the centerpiece of PRESS, during the opening. “This One Goes to ELEVEN, Part 2,” features pressure prints, linoleum prints, prints with moveable type, and book art and paste papers that were created by the various artists of PRESS, as well as by those who have worked in the PRESS space over the summer. Print projects by artist and IS 183 teacher Karen Arp-Sandel will be featured in this exhibition. 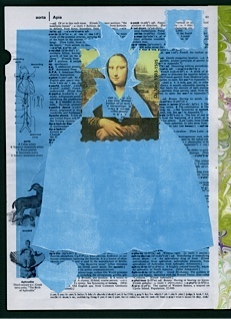 Arp-Sandel, who works in collage and mixed media work, has integrated pressure printing into her series of collages entitled “Dictionary Dresses.” Along with the Dictionary Dresses series, she has created typeset mixed media works based on found poetry, which relate to her experience as an artist-in-resident at Bascom Lodge this summer. This body of work illustrates Arp-Sandel’s style of making both abstract and narrative collages. Several series of prints done by Mowinski also will be on display. An assistant professor of visual art at MCLA and proprietress of PRESS, Mowinski looks forward to introducing her students to the magic of PRESS this fall through a series of projects that will take place in the PRESS storefront. Some pressure prints and linocuts that she created this summer will serve as samples for the future student projects. Other work on view is by artists who have regularly worked at PRESS over the summer. Emily Cohane-Mann, gallery volunteer, will be represented by her large scale wood cuts. Pam Buchanan, apprentice, will exhibit pressure printed books and other creations. Carrie Converse, gallery volunteer, will display her intricate experiment in low relief pressure printing. PRESS is located at 105 Main Street in North Adams. For more information, go online to http://letterpressasapublicartproject.wordpress.com or contact letterpress105@gmail.com. DownStreet Art is a project of MCLA’s Berkshire Culture Resource Center, partnering with the City of North Adams, Develop North Adams, Massachusetts Cultural Council and Massachusetts College of Liberal Arts. The program is made possible through leading sponsorship support provided by Berkshire Bank, Excelsior Printing, Orbit Visual Graphic Design, Jarvis W Rockwell and Scarafoni Reality. Additional support is provided by: Adams Co-Operative Bank, Hoosac Bank, The Porches Inn at MASS MoCA and The Sushi House. The initiative was designed to revitalize downtown North Adams by identifying the city as a cultural haven. The program serves not only to increase MCLA’s visibility, but also to showcase what other local arts organizations have to offer. For more information about DownStreet Art and the Berkshire Cultural Resource Center, go to www.downstreetart.org and www.mcla.edu/bcrc.